The happiest day in Mylee’s short life thus far, according to her parents, is the day that McDonalds announced they would serve breakfast all day. What does that mean for Mylee? PANCAKES ANY TIME OF THE DAY OR NIGHT! 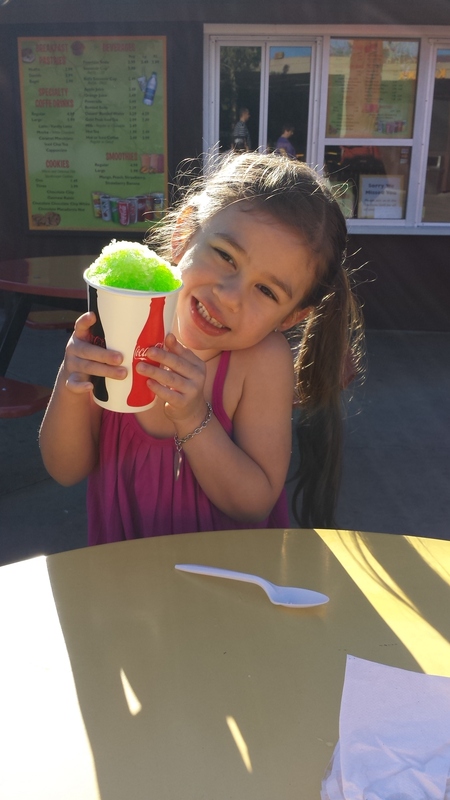 Snowcones are better than pancakes on a hot summer day, even for Mylee. I like pancakes too, though not as much as Mylee. I like my pancakes in the morning. I’ve never been a huge fan of the upside down dinner — you know, breakfast for dinner. And I’m a bit fussier than Mylee. I prefer my pancakes with real maple syrup. I think my daughter-in-law Lauren agrees with me, being a life-long Vermonter. Vermont is the only place I’ve ever visited where the breakfast restaurants only serve real maple syrup with pancakes. I venture to say they go even further and serve only maple syrup from Vermont. No Oh Canada for them. Now, that made me laugh because I’m quite certain her mommy doesn’t walk in the door after picking them up from school and start flipping pancakes. It reminded me of the time that I was babysitting The Cousins while Dave and Jll were away on a trip. Alastair was the first one up, as usual. I asked him what he wanted for breakfast. “Banana bread,” he said without hesitation. “Well, I don’t have any banana bread,” I told him. “Then, you could make some, Nana,” he replied, undoubtedly thinking, “well, duh!” Apparently my grandkids think that when it comes to cooking, I have superpowers. Ain’t so, I’m afraid. I very often make pancakes for breakfast, and ALWAYS do when I have grandchildren sleepovers. Some like them with chocolate chips. Others prefer to have an M&M or 2 or 3 dropped into the batter. Kaiya is a purist and wants only a smear of Nutella on hers. Pancakes from scratch are the easiest thing in the world to make. No boxes necessary. I use the recipe out of my torn and food-stained Betty Crocker Cookbook that I’ve had for 45 years, and it never fails me. One requirement (at least for me)? A cast-iron griddle. Beat egg with hand beater until fluffy; beat in the remaining ingredients just until smooth. For thinner pancakes, stir in additional milk. Grease heated griddle if necessary. 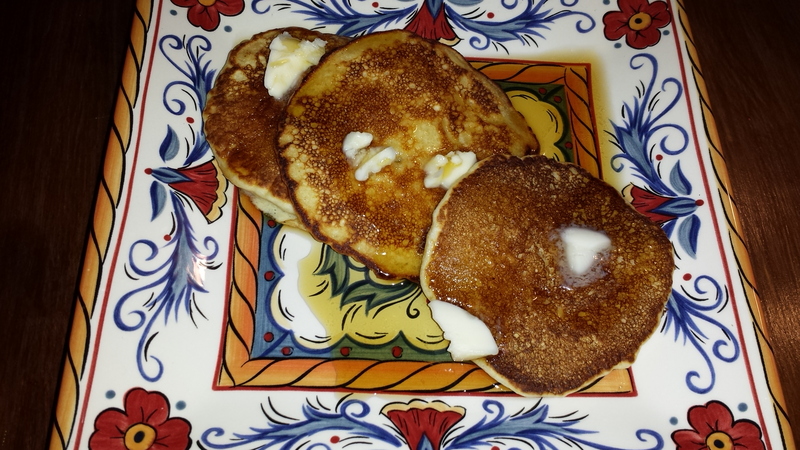 For each pancake, pour about 3 T batter from tip of large spoon or from pitcher onto hot griddle. Cook pancakes until puffed and dry around edges. Turn and cook other side until golden brown. If using self-rising flour, omit baking powder and salt. 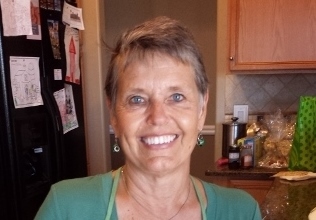 Nana’s Notes: I never use an electric mixer; I always use a whisk and mix by hand. For reasons I can’t explain, the first pancake never browns properly. It tastes fine, but is consistently less pretty than the rest. For that reason, I always start with just one pancake to get it out of its system. From then on, I cook two or three at a time. I ALWAYS use self-rising flour and therefore have no need for baking powder. That way, as long as I have self-rising flour on hand (which I always make sure I do), I can make pancakes on a whim because I almost always have the rest of the ingredients. Any leftover pancakes go into the freezer and can be heated up by putting the frozen pancakes into the microwave for one minute. Not quite as good as freshly made, but it will satisfy Mylee in a pinch. There’s no way around it, summer months are my very favorite. I love hot weather, sleeping with my window open at night, blooming flowers, green lawns and long days of daylight. But every year the tastes and smells of autumn make me very happy. I burn a fragrance candle every morning before work and every evening when I am relaxing. The smells of pumpkin, cider, apple and cinnamon mean autumn is upon us. Those fragrances make my heart smile and my blood pressure go down. Okay, maybe no health benefits, but the fragrances of fall take me to a happy place inside. 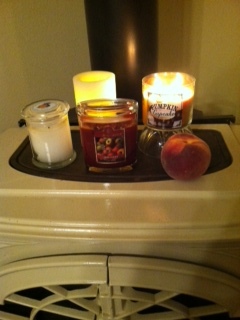 My favorite fragrances this fall are Pumpkin Cupcake, Apple Orchard, Apple Cider Donut, Mulling Spices and Apple Chutney. And yes to anyone wondering. Candle storage takes up a good deal of space in my little house! Coffee in the morning is my favorite meal of the day. Yes, I said meal. Because when you pour milk and flavored creamers in your coffee it takes up calories you could be consuming as an egg white omelette with whole grain toast. Yuck. My favorite coffee of the entire year is pumpkin spice with pumpkin spice creamer. 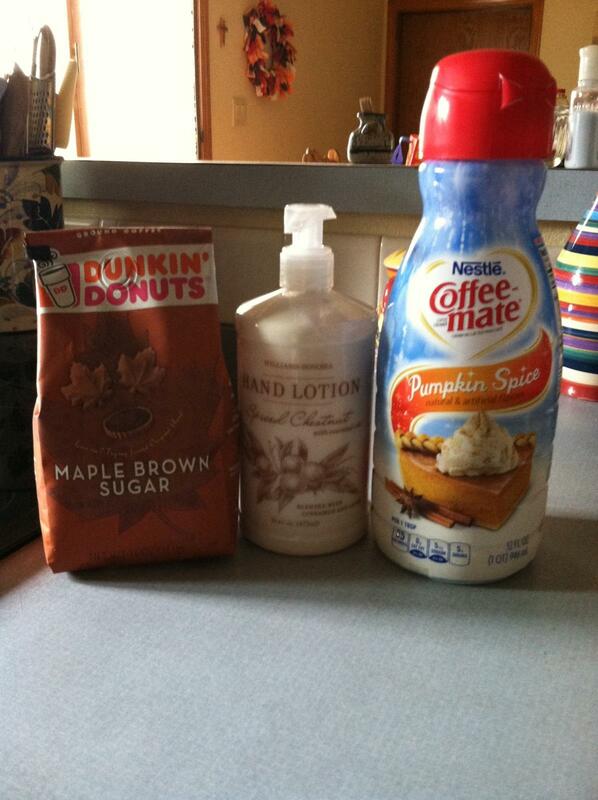 Please notice in the picture, Maple Brown Sugar flavored coffee. Oh happy days! One final and favorite taste and smell of fall is my first dinner prepared with green chilies freshly roasted at my favorite farmers market. Because skinning and cleaning the chilies is a ghastly job, I clean enough chilies to last the entire year. It’s always fun to prepare the first meal with the chilies to taste how hot and flavorful they are. You never know until you taste them. Almost always, my first-taste meal is chili rellenos. Many years I’ve filled an egg roll wrapper with chili and cheese. I fry them in a little oil or spray a cookie sheet lightly with oil and bake them in a hot oven. 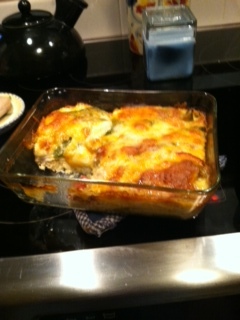 This year I tried a relleno recipe a friend has been talking about and they were delicious. I cut this recipe in half and it worked out well. My fall time taste honorable mention goes to Palisade peaches. I know Kris has blogged about them this summer but they taste even sweeter when fall is in the air! Though summer will always be my favorite season, the tastes and smells of autumn delight me and prepare me for the cold weather ahead. In a 9×13 casserole dish, place a layer of green chiles. Add chicken on top of chiles. Top with shredded cheese (about half of your mixed cheese) Add a layer of chiles on top of cheese. In a bowl beat eggs, evaporated milk, salt and flour. Pour on top of chili layers. Top with the rest of cheese. Bake at 350 for 45-60 minutes or until done. Let rest 5 minutes before cutting!! Nana’s Notes: This recipe sounds delicious, and I will try it soon. This is the full recipe, but Jen mentioned she cuts this recipe in half. Maggie and I give each other a subscription to Food Network Magazine each year. I enjoy cooking and taste-testing new recipes. I found this recipe in the April 2014 edition. I would say 75% of new recipes I try, I never make again. But I knew this recipe was a winner the first time I tasted it. I’ll share the recipe without cutting down the quantity. 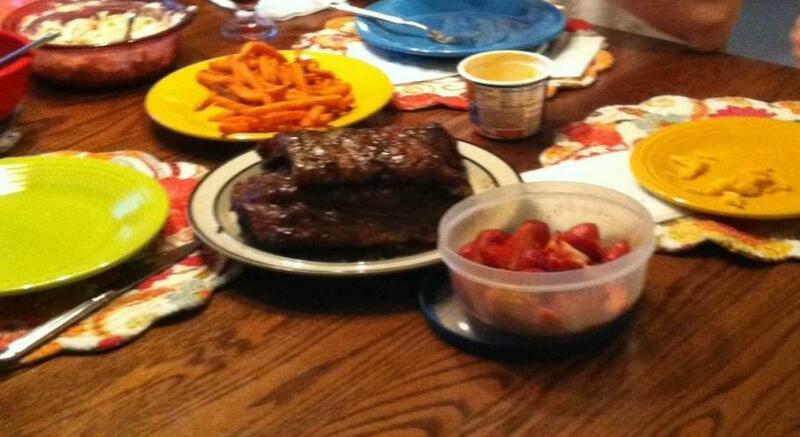 The first time I made it I cut the sauce in half and cooked only a small rack of ribs for myself. I made it recently for my kids on Maggie’s first night visiting in Colorado. It was a hit. As a matter of fact, BJ and I learned quickly not to come between Maggie and this sauce! She was dipping any and all food at the table in it. The sauce is delicious but my best take-away from this recipe was that these cooking instructions for the ribs cooks them perfectly. Follow the timing exactly as the recipe states and you won’t be disappointed. I served this with the Blue Cheese Cole Slaw Bec introduced me to, sweet potato fries (frozen, I love Alexia brand) and garlic bread. If you have Maggie over for dinner, double the sauce. Combine ½ cup of the hoisin sauce, the vinegar, honey, soy sauce, Sriracha, ginger and garlic in a 6-quart slow cooker. Add the ribs and turn to coat with sauce. Cover and cook on low, 6 hours. When the ribs are cooked, transfer 1 cup of the liquid from the slow cooker to a medium bowl; whisk in the remaining ½ cup hoisin sauce and the ketchup. The recipe calls to transfer the ribs to a foil lined baking sheet and brush both sides generously with the sauce, then broil bone side down until browned and bubbling, 3 – 5 minutes. I did that final part on the grill. Transfer to a cutting board and slice into individual ribs. If this sauce doesn’t appeal to you, substitute this cooking process with whatever sauce you prefer. 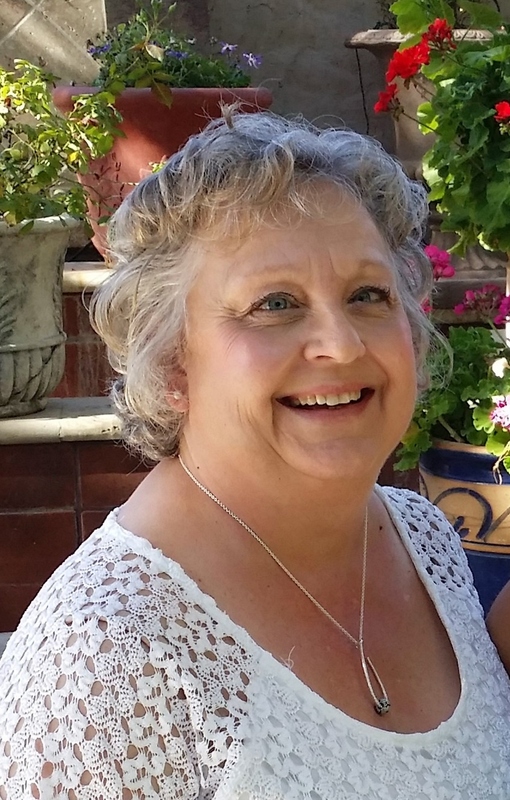 My sister Jennifer Sanchez is going to become a regular contributor to Nana’s Whimsies, offering us her unique perspective on cooking for one or two. 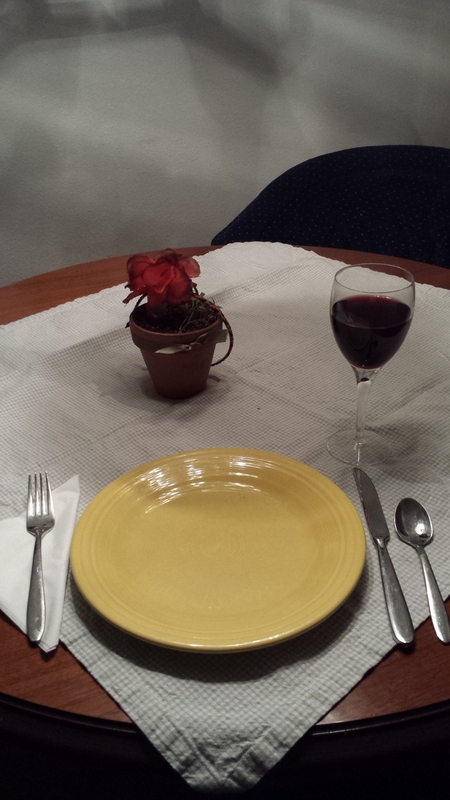 Many years ago, thirteen to be exact, I was met with the challenge of cooking for one. For nearly all of my adult life I had cooked for a family and suddenly this changed. It took a long time to adjust to cooking for one but over many years I believe I have this down pat. When I was first single I knew a couple of things. One, I was never going to be the person who ate a bowl of cereal or a bowl of popcorn for dinner. The second thing I figured out quickly was dining on a Lean Cuisine after a long day at work wasn’t going to work for me. I thought surely if I ate it with a glass of wine, that would pull it up a notch. Blah, yuck, gross. On occasion I’ll post on Nana’s Whimsies and give you ideas for cooking for one or two. Yummy dinners that are as satisfying as cooking for a family. I love to watch Food Network. And I love to read new recipes. One thing I most always do is cut the recipe in half and sometimes in thirds. I always find that it works perfectly that way. Be forewarned, I make a few changes to every new recipe I try. For example, this recipe called for melted butter in the sauce. I’ve never added butter, so I can’t tell you if it’s better that way. Paula Deen would say it is better that way! ¼ tsp of Worcestershire sauce. Whisk all ingredients in a bowl and prepare a bone in chicken breast to grill. Sprinkle some olive oil over the breast and season with garlic salt and course pepper. Let the chicken breast sit in the sauce for approx 10 minutes. Grill the chicken, basting with the mustard sauce during grilling. I think chicken can be tricky to get done on the grill so if the meat has nice grill marks but the outside seems to be close to burning, turn off one side of the grill and let the meat finish cooking from the heat of the grill. In the winter I’ve made this in the oven as well and it is equally as good. I served it this night with steamed broccoli (steamed in the microwave or baked in a hot oven in the winter) with a little of the mustard sauce sprinkled on top of that. 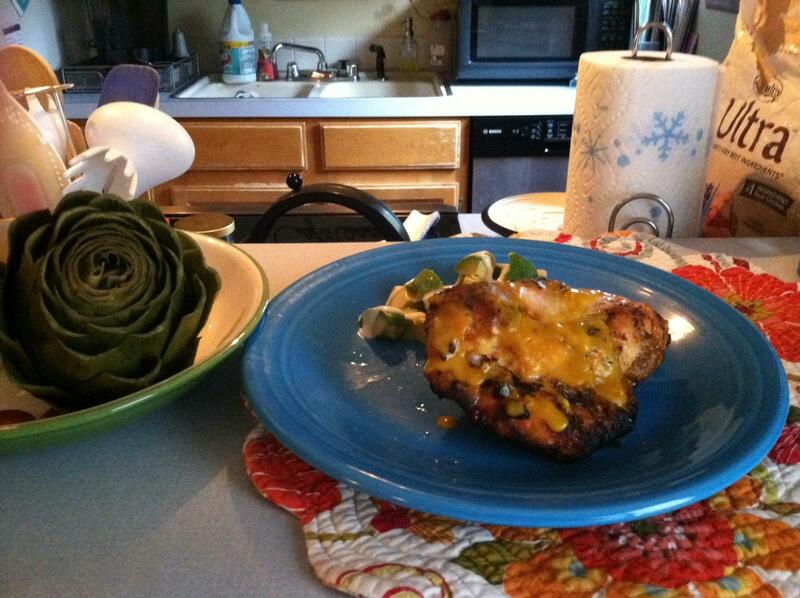 I made an artichoke as well.